ellehermansen: Kitten Survives Washing Machine Spin! This was in one of the Australian papers today! I mean it's a wonderful story that this little baby cat survived, but have you seen how CUTE Kimba is!?!? To lose such a wonderful little creature would have been heartbreaking! Now this will be a lesson learned for Lindsay and anyone with kittens doing laundry. Cats do have nine lives, but let's not take advantage of them ;) This is exactly what was quoted from digitalspy.com. I want to adopt this little fella! Mrs. Rogers is a lucky lady! I melt. 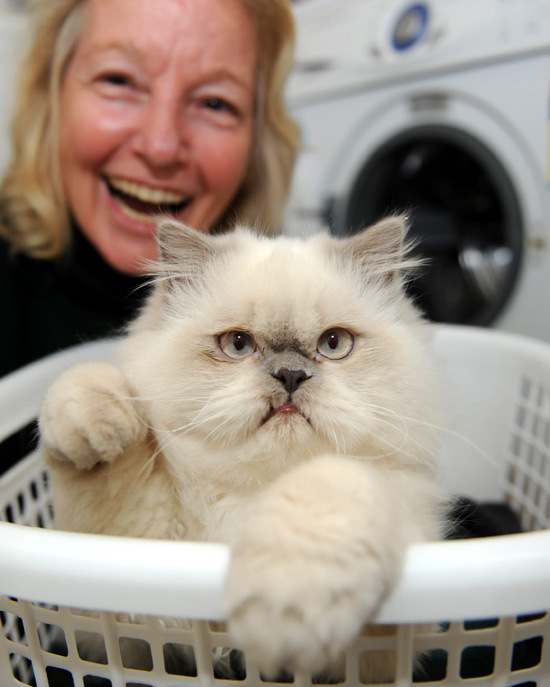 "A kitten in Australia has survived a 30 minute wash and spin cycle after sneaking into the machine without its owner realising. Lindsay Rogers told the Manly Daily that 4-month-old Persian Kimba had snuggled into the dirty clothes in the machine while his back was turned. Rogers said: "I put the clothes in, put the powder and the fabric softener in, put it on a cold wash - which was very lucky - and put it on for a 30-minute cycle. He added that Kimba recovered and was "purring like a little motor" following emergency medical treatment at Allambie Vet, including the use of an intravenous drip. After the news broke, Rogers said: "It's stirred up a bit of a hornet's nest. I had Channel 9 asking if they could come over, and I said, 'Sure, but Channel 7 has already been here'."